Dec 2012 - we hadn't had any significant rain for 2 months and things were looking dire. We also bought a house. Just the house, not the land! Jan 2013 - we sold the steers, we sold our Braford weaners, and finally it rained! 300 mL on the Australia Day weekend (25th Jan) and work was cancelled for one day (paid work that it, not farm work). 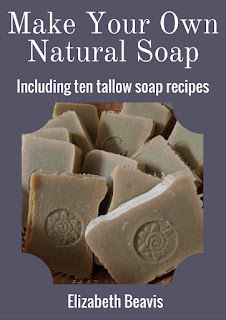 I made tallow soap. We got guinea fowl keets. We had some highs and lows with the chickens this year! We started off with our best hatch ever (34 from 48! ), followed by me shutting the cage before the babies went home and about 15 of them were eaten by something during the night. And most of the rest of them died of a mystery illness, possibly paralysis ticks, we ended up with 3 roosters for the freezer, one Rhode Island Red rooster (who only survived the masacre because he was hiding in a hay bale because the other chickens picked on him, but he's better than nothing for breeding!) and 2 hens. I don't think we are ever really prepared for the loss of a pet. Even when they are getting old, like both our dogs and you start thinking about what might happen, you still aren't ready when it happens. Chime died on Monday, around midday. She had been active all morning, but then Pete found her lying down and unable to get up. He lifted her into the car and rushed her to the vet, but she didn't make it. We're not sure what happened, it was too quick for a paralysis tick, he couldn't find a snake bite, we can't think of any poison that she could have eaten, maybe it was just old age, she was 12, nearly 13. I realise now that most of the photos I have of her she is sleeping. She must have really slowed down, but we hadn't noticed. We only looked after her for 2 and a bit years, she belongs to a friend who is overseas, but she came everywhere with us and slept inside, and she had bonded with our dog Cheryl. The farm is a constant source of entertainment and learning for us. We try to view it as a hobby and wonder what else we would do on our weekends if we didn't have fields to plough, cattle to chase and fences to mend! Of course our long term plan is to only have one farm, but we currently have our Eight Acre property (for which this blog was named) and our 258 A property (which is sadly still a hobby farm! 8 acres becomes 258 acres). I hope by sharing some of our experiences here, new hobby farmers don't make the same mistakes that we did, and more seasoned farmers might pick up some of our ideas that work and use them for themselves to improve the sustainability and viability of their farms. The cattle have certainly kept us busy in 2013! At Eight Acres (and part of our neighbour's place) we currently have the two Jersey house cows (Bella and Molly), their calves (Nancy, and Monty, who is now weaned), Bella's previous calf, Romeo (who is next up for the freezer), Benny the Braford that had paralysis tick as a young calf (destined for our neighbour's freezer) and Donald our tiny Dexter bull. This year we had Frank(furter) butchered as well. 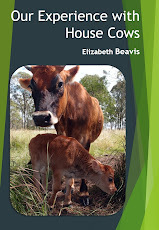 At Cheslyn Rise, after the brief experient with steers last year, we now have about 25 Braford cows and their calves. Unfortunately Maus our lovely Braford had to go due to an eye cancer. Its been other big year in the garden, I've learnt through trial and error and I think I'm starting to get better and growing our veges. As you know, each month this year I've been reviewing a principle from David Holmgren's Permaculture: Principles and Pathways beyond Sustainability. Now I'm up to the twelth principle (phew! ), creatively use and respond to change, it is somewhat ironic that Pete and I have recently made some major changes in our life! This principle is about anticipating and working with change, generating change for positive results and adapting to change that we can't control. I never expected that I woul write so much about food on this blog! When I started Eight Acres, I didn't realise the connection between self-sufficiency and preparing food. It seems very obvious now that if you want to be able to provide your own food, you're going to have to know how to cook it and preserve it as well as grow it. My food posts cover food that we've grown or produced ourselves, including beef, chicken, eggs, milk and vegetables, as well as preserving food that we've bought cheaply. For the past couple of years I have regularly made bread, yoghurt, kefir and cheese, and fermented drinks and pickles, stocks and sprouts. This year I learnt to make ice-cream and use a sourdough cake starter. I also reviewed a few different books about food and nutrition. Here is a selection of links from this year (and a few earlier ones) that you may find interesting. If you want to know why I eat real food, see this post: How did I get started with real food? ?